Conservationists have been warning about the negative impact pesticides are having on bees for years and have urged people to help them and other pollinators out by not using them in their gardens. Unfortunately, in our effort to help, we’ve actually been unwittingly contributing to the problem by buying flowering plants and trees that are pre-treated with them. While there are a number of factors that have contributed to the decline in pollinators, scientists and pollinator advocates have continued to point to the dangers posed by a class of pesticides otherwise known as neonicotinoids (neonics). They’re used on a lot of major crops, but they’re also lurking in our backyards and public spaces. In 2014, Friends of the Earth and the Pesticide Research Institute released a troubling report, Gardeners Beware, as a follow up to a study in 2013 that found these pesticides are present in more than half of the “bee-friendly” plants being sold at major stores in the U.S. and Canada, including Walmart, Home Depot and Lowe’s. The findings were really bad news for bees and other pollinators. At low doses, neonics can weaken them and make them more vulnerable to diseases, pests and other stressors, while higher levels are enough to kill them directly. While the issue is being tackled from a number of fronts, from urging the EPA to crack down on their use and pushing for legislation at the local to federal level that will stop their use, pollinator advocates have also called on stores to do their part by not selling poisonous plants. Retailers including Lowe’s and Home Depot pledged to phase out their use and the latest findings show their efforts are paying off. According to the latest report, there’s been a significant decline in the amount of plants being sold that contain neonics. In 2014, 51 percent of the plants tested contained neonics, but the latest testing has found that the number of flowers and trees with these pesticides at levels that can hurt or kill bees is down to 23 percent. Not only is the change good for pollinators, it’s good for business. According to Friends of the Earth, recent polling has also found that people had positive reactions to the changes that Lowe’s and Home Depot made, and more than half of the people surveyed would be more likely to shop there because of it. 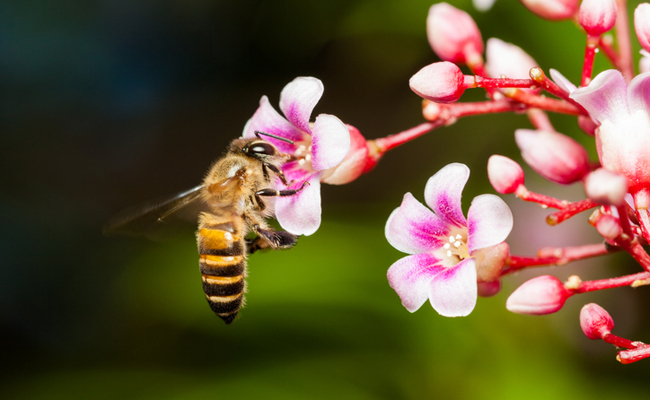 Unfortunately, other stores including Ace Hardware, True Value and Walmart have yet to commit to ensuring the plants they sell are really bee-friendly. For more info on how to help pollinators, visit the Pesticide Research Institute and Friends of the Earth’s BeeAction and Bee Cause Canada campaigns. If you’re looking for plants, Beyond Pesticides also has a Pollinator-Friendly Seed Directory that offers a comprehensive list of companies that sell organic seeds, including vegetables, flowers and herbs, directly to the public and also has a how-to-guide on managing landscapes to support pollinators. Signed the petition for bees, thank you. Also, I appreciate knowing about the seed source above. This news doesn't surprise me - no wonder Canadians are so cynical. About a year ago I discovered that Home Depot was selling a Monsanto product. I haven't been back. Every time I read about the link between colony callapse, I plant more bee balm, butterfly bushes and another fruit tree. I am very protective of my hives and applaud Lowe's and Home Depot. Now if if only the crop duster across the woods. Sad to think you are protecting the environment when the plants you buy could really be quite the opposite. I rarely plant anything because I live in the woods and there really isn't very good soil but I would hate to think a new plant might be a bad influence to all the others. This is so frightening. I never use chemicals in my garden and have a lot of bee and butterfly friendly plants but I did not think that any new plants I buy would be sprayed. I have been growing a lot of plants and will check in future when I buy new plants whether they have been sprayed. I've noticed that we have had hardly any honey bees for the last few years and it worries me because we used to have so many. People really need a huge campaign to push home how frightening this situation is. By the way, having had contact with Monsanto re G.M. in Scotland I detest that company who don't care what their chemicals or crops do to this planet. Money is their God. chris B. wrote: ''Soon there will be no food at all.'' We are not going to let that become reality!! Our future and our children's future are depending on it! !